On the right the ELOS applicator is nested at the black unit base the Philips applicator (left) is the same size as the ELOS applicator, but looks larger in the image. Philips IPL does not have any base unit. If you are searching a home light-based hair removal system, you may be looking for information about the IPL and ELOS technologies. Both technologies have been invented by the same Israeli scientist named Dr. Shimon Eckhouse. First Dr. Eckhouse invented the IPL in the 90th and then at ten years later, the ELectro Optical Synergy (ELOS) as an upgraded technology based on the former IPL. When comparing two hair removal systems, you need to break down the specs and check which of them is more suitable for you. Price: There is a price difference which is in favor of the Philips Lumea, but buying the cheaper system may in some cases be a mistake if it is may cause safety issues or be ineffective. You can order the Philips Lumea Comfort IPL at about $220 list price at Amazon. The Me my ELOS would cost double with Amazon list price starting at $450 and with the premium attachments even reach $600. 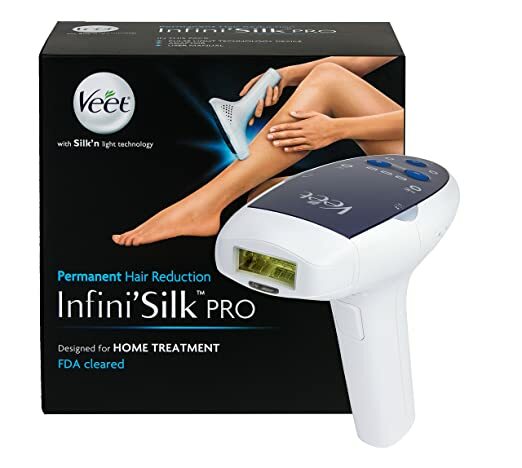 Technology: Both IPL and ELOS are approved by FDA, as safe technologies for home hair removal. Philips IPL is intense pulsed light, (a flash of light like in a camera) which is a safe well known technology. The light energy gets to the dark pigment in the hair and warms it up. The IPL flash energy is so intense the dark pigment warms up until it burns. ELOS is combined of two technologies IPL + RF (radio frequency). The ELOS use low energy IPL to heats the hair, and then send a RF wave which heats hair until it is zaps. The main difference is that the RF adds heat without affecting the surrounding skin. Safety: The main difference is that IPL technology is NOT safe for dark skin tone, and not for blond or red hair colors. When treating blond hair (which has little or no dark pigment also) the IPL flash will also spread to the skin and may cause adverse effects. Philips Lumea IPL – When treating any dark skin (naturally tanned, African, brown, black, Hispanic, Indian) the IPL flash is absorbed by the pigment in the skin, which get immediately burned! Treating dark skin with Philips IPL can cause severe skin burns and lots of pain. IPL is also NOT approved for blond, red or white hair removal either. Me my ELOS on the other hand, is approved by the FDA to treat ALL skin types and all hair colors. The ELOS flash is softer, and the RF are radio waves which do not affect the dark skin. This means that ELOS is the only solution for home hair removal treatments for people with naturally tanned or dark skin. All IPL systems including the Philips Lumea IPL have a skin color sensor, which locks the device from pulsing on dark skin. The Me my ELOS does not need such a sensor because it can treat any skin color. Energy Capacity: For a full body hair removal which includes both legs, both arms, bikini line and underarms, for 3-4 sessions about 5000 flashes are needed. The Philips Lumea IPL has 100,000 flashes installed in it. The main downside, is that once the Lumea IPL energy runs out, the system can not be used anymore. You will have to buy another device. The Me my ELOS system has 120,000-200,000 flashes (depends which model you buy) but the difference is that the Me my ELOS use a cartridge, so once the 120,000 are finished and new ELOS cartridge can be bought and the system can be used once more. Treatment Window: The treatment window is an important factor, because larger window mean more skin area can be treated in each pulse. This has an impact on the time length of a home treatment session. The Philips Lumea IPL window is 2.7 cm² (0.42 sq. in) which is quite small and may be good for small skin area treatment like underarms and bikini line. Treating large areas like a legs or chest & abdominal (for men) can take long time. The Me my ELOS window size is 6 cm² (0.93 sq. in) which is double than the Philips. This means ELOS will cover the same area with half of the pulses, and do it in half of the time too. Pulsed light repetition rate: The time needed for the device to recharge another pulse, this (with the window size) affects the overall time needed to conduct a treatment. Philips Lumea IPL – Recharging takes a few seconds depends on the intensity level. Me my ELOS – 2 pulses per second, the most efficient device in the hair removal category. Me my ELOS 10 minutes. Facial Hair Removal: Treating the face is not approved by the FDA for home IPL systems. Many people use IPL systems to treat their facial hair. not recommended for facial treatment” though they say on their website it can treat chin, upper lips and other facial areas.. The Me my ELOS is approved to treat women facial hair but not men facial hair. The Me has a special facial adapter, which narrows the window, so smaller areas like upper lips could be treated safely. The fact that the Me my ELOS is a superior system, using better technology does not mean it is better for you. If you are not have dark skin or blond hair you can chose which device you prefer. If you HAVE dark skin the ONLY safe system for your skin will be the Me my ELOS. Even if you try to use another device you will find out it will not operate because of the skin tone sensor. If you need a small compact device for small touch up treatments like underarms or bikini line, or even facial hair reduction. Click here for the Amazon offer for the Philips Lumea Comfort IPL Hair Removal System, it might be the suitable solution for you. If you plan on a full body hair reduction, from all the body, then there is no doubt that the Me my ELOS is by far a better choice. Click here for Amazon offer: Me My Elos Touch 200,000 Pulses IPL RF Hair Removal System model 2014/5. Though it does cost more, it the current Rolls Royce system, with added attachments, better technology, faster treatments, safer for all skin and hair color types. This entry was posted in IPL Hair Removal, Laser Safety, Safe Removal Systems and tagged Me my Elos Hair Removal, Me My ELOS Pro Ultra Hair Removal Review, Philips Lumea Comfort IPL, philips lumea hair removal, Philips Lumea IPL by admin. Bookmark the permalink.